Players must be level 110 to gain access to Suramar. To access the quest that rewards this pet, players must first complete a quest chain that starts in Dalaran. Khadgar will have a quest for level 110 players called Khadgar's Discovery. Completing this quest chain will satisfy the 'Nightfall' objective in the meta-achievement Nightfallen But Not Forgotten. After doing this, a set of quests will unlock at a small camp northeast of Falanaar, the last being the quest that rewards the Lurking owl Kitten. This pet is amazingly powerful and confusing. Screech has the ability to allow Quills to get it's extra hit in vs most pets. In addition Feathered Frenzy will make it even more powerful. 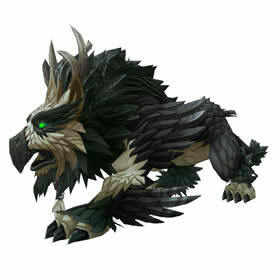 Now just consider the beast racial being taken into play and you have a very unique pet. I have heard Sunlight makes beast pets automatically be considered to be at 50% life and thus increasing their damage by 25%. A good pet to battle with would be Enchanted Torch with Illuminate and Flash.